Everyday meals are so much more fun when there is some fresh fiery chutney in the fridge. I mean the fresh chutneys stay fresh for a couple of days and make life easier, and tastier. Our everyday meals are mostly Indian and chutneys are my favourite way to include loads of vegetables and fiber in my food. And most chutney ingredients are high in antioxidants, Vitamins and minerals too. If I add nuts, seeds and sprouts the chutneys bring a boost to calcium intake as well. So much more worth to chutneys I say. Make your chutneys value added, include them with every meal, take second helpings and eat well. These fiery chutneys will take care of everything else. 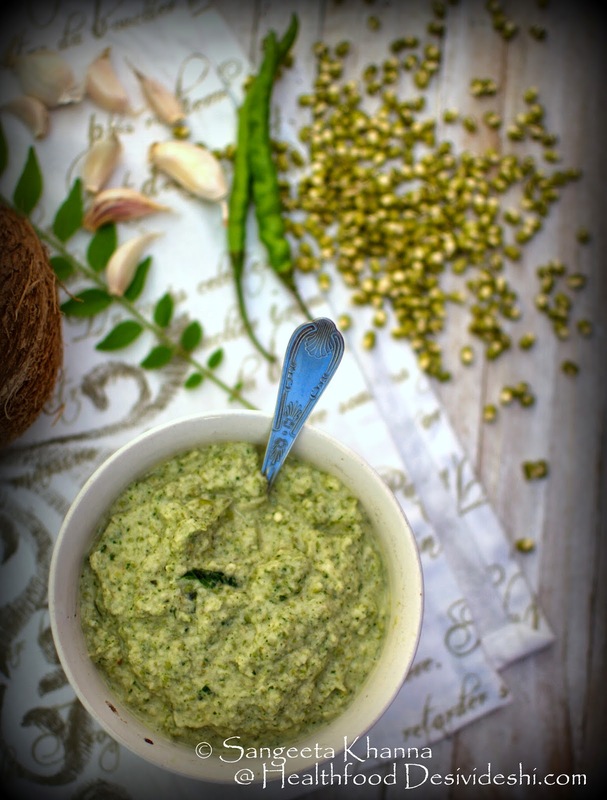 This sesame-peanut-coconut chutney is a good supplement of daily Iron and calcium, it is a tried and tested recipe and has helped many people get back to strong bones. 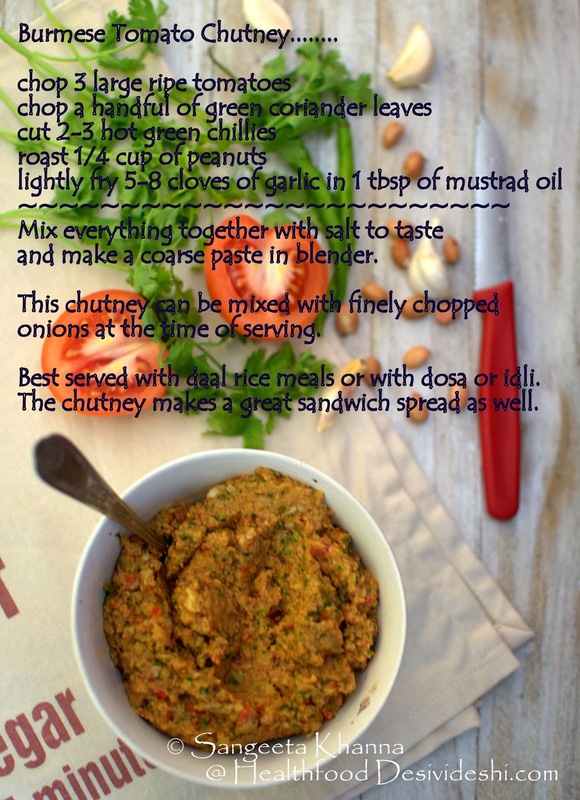 All the ingredients of this chutney balance the nutrient profile helping optimal absorption of nutrients as well. We can try and make all chutneys to supplement everyday meals with essential nutrients. 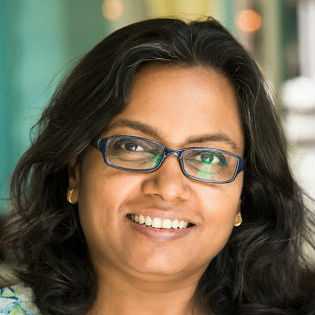 It was last month when my friend Promilaa Bhatia shared a Burmese tomato and peanut chutney on a food group and I wanted to make the chutney then and there. And I did, the chutney was so simple and I had all the ingredients. Also, I was alone at home that day and wanted something to wrap a multi grain roti around. This thick fiery chutney felt right and it did taste great too. The Burmese tomato chutney was so quick to make that it barely took a 30 minute break from my desk to finish my frugal meal of a multi grain roti smeared liberally with this thick chutney and had like a quesadilla. I made the roti and blended the chutney in this time and ate it too. Here is the recipe of this Burmese tomato chutney. The recipe makes enough chutney to last 2 meals for one. 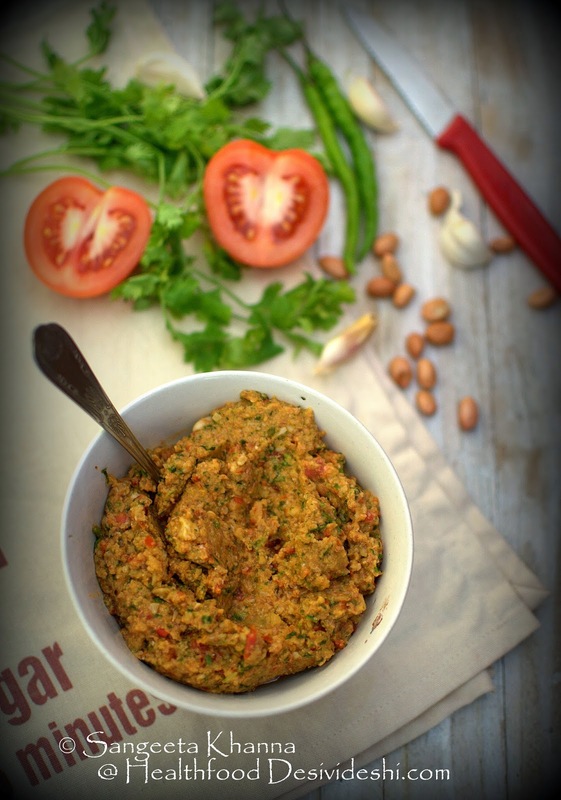 Just fry some garlic cloves in mustard oil, add to a large bowl of chopped ripe tomatoes, throw in some fiery hot chillies, some chopped coriander greens and some roasted peanuts with skin. Blend to make a coarse paste. I had this chutney with a buckwheat crepe the next day. And I whipped up another chutney too as I was feeling chutney inspired and had some mung sprouts in the fridge. This one was blended smooth and made a refreshing accompaniment to my brunch plate. 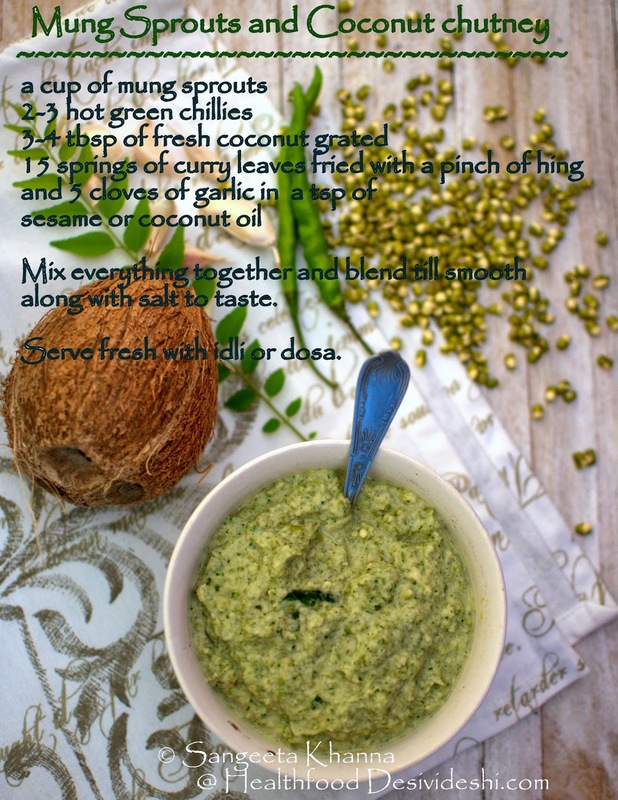 Here is the recipe of the mung sprouts chutney. Fry a few springs of curry leaves along with a pinch of hing and a few garlic cloves in a tbsp of sesame oil (or any oil you like). Add some sesame seeds if use any other oil. Add this tempering to loads of mung sprouts, some fresh grated coconut and chillies to taste. Blend till smooth and enjoy. I love these chutneys for being so power packed. Better than smoothies as I love savoury breakfasts and fruit based smoothies don't always fit into my scheme of things. Add loads of curry patta and coconut to this mung sprout chutney and have second and third helpings. 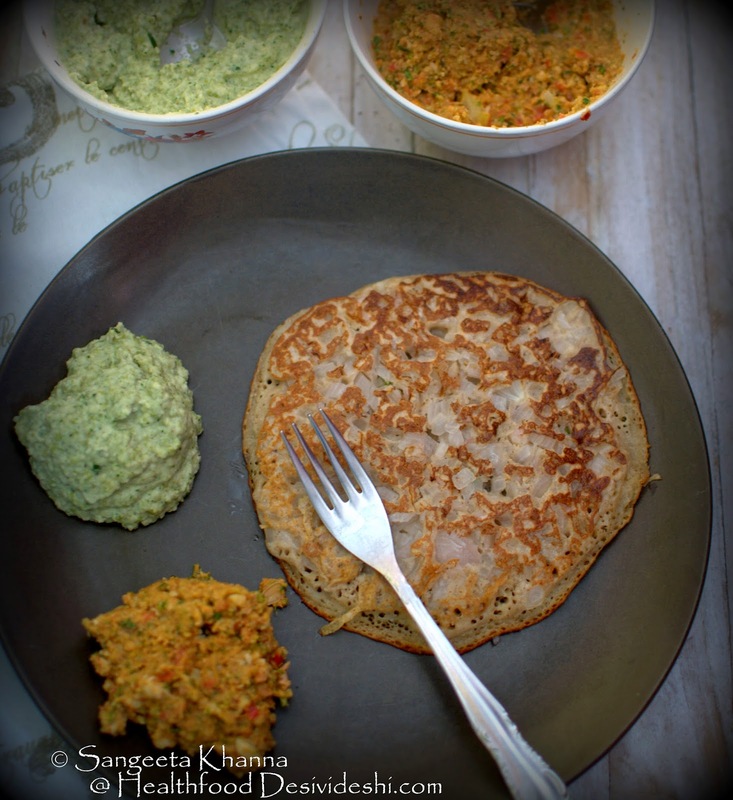 I love such chutneys with my buckwheat or amaranth dosa (savoury crepe) or even with a beans and rice meal like rajma chawal or chhole chawal. Have you tried making chutneys with mung sprouts before? Now is the time if you haven't. Let me know if you try these two fiery yummy chutneys. Keep the chilly heat suitable to your taste and eat loads of these chutneys. You can thank me later.